Summary: In the time of Noah, there was only one place of safety. So it remains in ours. 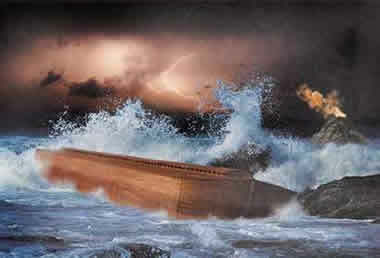 Noah’s Ark was a chapel in Christ’s Church and those aboard were rescued from the temporal and eternal death outside. There is no salvation outside the Holy Christian Church. God brings us aboard through water and the Word, provisions us with His Son’s body and blood, and takes care of navigation, bringing us not to the Mountains of Ararat but to His holy mountain, Zion — the New Jerusalem, city of the saints and forever blest. Included in today’s worship was the hymn By All Your Saints in Warfare, in which we sang this stanza about Noah. Text: Now who is there to harm you if you are zealous for what is good? But even if you should suffer for righteousness’ sake, you will be blessed. Have no fear of them, nor be troubled, but in your hearts honor Christ the Lord as holy, always being prepared to make a defense to anyone who asks you for a reason for the hope that is in you; yet do it with gentleness and respect, having a good conscience, so that, when you are slandered, those who revile your good behavior in Christ may be put to shame. For it is better to suffer for doing good, if that should be God’s will, than for doing evil. Audio: Click to hear the MP3 of Safe in the Ark.